Jeannie Lawson has been educating the community about the environment since the age of 10 when she led nature walks at her school. Since then, she has incorporated her passion for nature into every aspect of her life, working towards bringing respect for the animals and plants with which we share our world. With qualifications in tour guiding, bush regeneration, teaching, veterinary nursing and natural health (among other things) she also has 40 years of experience to bring to the educational experiences she offers on her tours. In 1989 she established her own eco-tour business, Harmony Visions, and has been involved in many large community ventures under that banner (including writing the blueprint for the now-national ‘Clean-up Australia Day’ held in March each year). Jeannie was the first to begin community whale watching sessions on the coast and is co-founder of the annual Whale Dreamers Festival held at Norah Head each July. In 1999 she founded the marine conservation group, Ocean & Coastal Care Initiatives (OCCI), which now has four branches along the NSW coast. Her favourite tour topics at the Forest of Tranquility are insects and bush foods/remedies, as well as the nature philosophy behind ancient cultures. She has been the recipient of several major awards over the years for her environmental work, the most recent being the state AND national ‘Pride of Australia Medal’ in 2011. 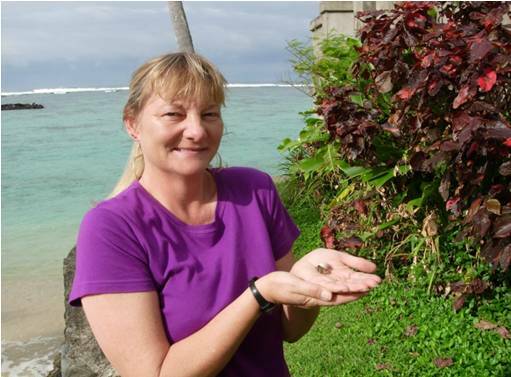 Jeannie’s knowledge, passion and compassion for nature shines through in the enthusiasm she has as an eco-tour guide.